At Wireless Terminal Solutions, we work with thousands of small businesses to supply countertop card machines for retail premises. Our countertop card machines, offer a cost effective payment solution to businesses operating from a fixed location. Countertop card machines deliver undeniable flexibility for a company that operates from a fixed location and they are perfect if your business is looking to accept debit and credit card payments. As more and more customers look to pay by card, meet the growing demand and ensure your business never misses a sale whilst presenting a professional image. Wireless Terminal Solutions’ countertop credit card machines are trusted by many UK retail businesses because of their simplicity to use as well as their speed and security. A countertop handset is sometimes referred to as a static or desktop handset and it connects directly to a PSTN or IP line and a dedicated power source. The Chip and PIN technology increases safety and reliability.Take card payments from customers at your till or service point choosing the Ingenico countertop card machine. 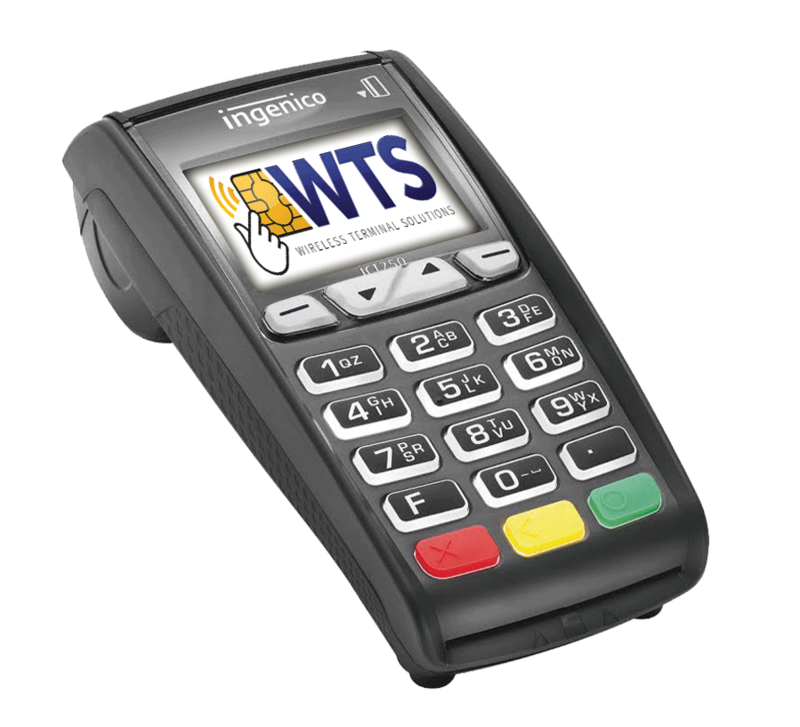 Wireless Terminal Solutions provide the latest countertop card machines, the Ingenico ICT220 and ICT250, and excellent customer service. Our Chip and PIN machines are popular in a wide variety of sectors including retail premises and sporting venues. The countertop card machine brings the latest technology to your business, including contactless enabled (for payments up to the value of £30), meaning you can serve more customers than ever before and also eliminate lengthy queues at peak trading periods. With fewer people now carrying cash, a countertop card machine will help your business increase sales as well as adding credibility to potential customers and making it look more professional. Find out more about all of the card terminals we offer at the card machines header. Every credit card machine has its own benefits and it is imperative to ensure you get the right machine for your business model; our trusted team are available to support you in this. We provide the latest countertop card machines, the Ingenico ICT220 and ICT250, and excellent customer service. Our Chip and PIN machines are popular in a wide variety of sectors including retail premises and sporting venues. The countertop card machine brings the latest technology to your business, coming with the contactless facility, meaning you can serve more customers than ever before. With fewer people now carrying cash, a countertop card machine will help your business increase sales as well as adding credibility to potential customers and making it look more professional. Find out more about all of the card terminals we offer at the card machines header. What is a countertop card machine? What are the key aspects of having a countertop card machine? What sectors are countertop card machines popular for? Is a countertop card machine suitable for an exhibition? Are countertop terminals available on short term hire? Is a countertop card machine referred to by anything else? I keep hearing PSTN associated with a countertop card machine, what is this? Will a countertop card machine connect via Wi-Fi? Do countertop card machines accept payments via AMEX? Do countertop card machines accept all major debit and credit cards? What is a dual splitter? Will I be able to make calls if my countertop handset is connected through my phone line? Are countertop card machines contactless enabled? Are the countertop credit card machines accredited to work with every bank? How quickly can I have a countertop card machine? How can I get a countertop card machine? What support is given with a countertop card machine? Where can I buy countertop card machine accessories? How much does a countertop card machine cost? Are there any negatives to owning a countertop card machine? All our Chip and PIN card machines are fully configured to the merchant account prior to dispatch, meaning the countertop card machine simply needs to be plugged in and you’re ready to go. Our technical engineers offer over the phone tutorials once the PDQ machine has been delivered, giving you complete peace of mind. We work with a merchant referral partner to ensure a quick, cost effective service and in many cases save customers money than if they went to their own bank. If you already have an existing merchant account, we can link the countertop card terminal to your existing account allowing you to maintain the existing relationship with your merchant provider. Unlike some card terminal providers, Wireless Terminal Solutions work with ALL major acquirers (Worldpay, First Data, Elavon, Barclays, AIB, HSBC, Lloyds and AMEX) in linking the point of sale card machine to these accounts. Wireless Terminal Solutions’ popular countertop card machines are reliable and accept all major debit and credit cards and also accept contactless cards for even speedier payment. Payments are authorised and authenticated in seconds and you can rest in the knowledge the payments are protected by the industry’s anti-fraud standards for keeping customer card data secure. The countertop card terminals have been designed to meet the needs of both large and smaller independent retailers. A countertop card machine is a handset that predominately connects via your telephone line (PSTN) or broadband connection. There are many benefits to having a countertop card machine within your business but a few of these include delivering a professional image for your business. Countertop card machines are cheaper than other card machines on the market making them affordable and they are fast! If a business operates from a fixed location a countertop card machine is the perfect addition to run alongside your day to day running. They are extremely popular for the retail sector where a till or service point may be in a set location. Probably not. Most of the handsets we supply to an event or exhibition are mobile card machines, purely because of the convenience they bring. If you want to hire or bring a countertop card machine to an exhibition, we always recommend speaking to the operations team who are running the event, to ensure the venue has an infrastructure to support this. Please note the venue are likely to charge you a fee for this service which is why so many opt for a mobile handset as they deliver a cost effective temporary solution. A countertop card machine can sometimes be referred to as a static PDQ machine or desktop machine but is primarily known as a countertop card machine. PSTN is an abbreviation for “public switched telephone network” – this is a requirement in order for the handset to connect. Without a phone line/PSTN connection your countertop terminal won’t work. Yes, but please note this is dependent on the business having the correct merchant account in place. If you are unsure if your business accepts AMEX, please contact our customer support who will be able to advise on this. Yes, our contactless card machines are accredited to work with every acquiring bank and accept all major credit and debit cards. The countertop handsets are fully PCI compliant and deliver full security for your customers. A dual splitter can be used to connect two standard phone cable devices into one socket e.g. 1 telephones or 1 card machine into a single wall socket. If you have a dual splitter then you won’t be able to make phone calls if you are attempting to process a card payment. Easiest way to look at it, if one of these facilities is in use, then you won’t be able to use the other. Many retail environments do use this infrastructure though. The countertop card machines Wireless Terminal Solutions’ supply, are contactless enabled up to the value of £30. Some of the other card machines available from other suppliers aren’t (older software), so it’s always worth checking. Our contactless card machines are approved and accredited to work with every acquiring bank which includes Elavon, Barclays, First Data, Lloyds Cardnet, Worldpay, AIB & Global Payments. If your business already accepts cards and providing you complete and return all forms, we can have you set up in as little as 24 hours. Contact a customer representative on 0345 459 9984 and we can have you set up with a countertop card machine in a matter of days. All countertop card machines supplied by Wireless Terminal Solutions come with FREE set up, FREE tutorials, swap out facility and ongoing training. We pride ourselves on the support we give to our customers. Wireless Terminal Solutions supply a whole host of card machine accessories for countertop card machines. This extends from till rolls to replacement consumables, please visit our online store. This is all dependent on the length of contract. Prices start from as little as £12 a month (excluding VAT). This is dependent on your business model and how you operate. For example – If you are a market trader, and based outside the likelihood is you won’t maximise the handset to its full potential which could have a knock on effect.